Quickly convertible to three different sizes, this sturdy, handsome bag plays multiple travel roles. The old suitcase dilemma. No, not the one where you find a bag full of money and have to decide what to do. (Turn it in...right?) The one where you don't know which one to bring on vacation, especially if your trip has multiple parts. Our versatile, shapeshifting, Adjustable Bag solves the dilemma. Instantly expanding or contracting to three different sizes and 10 configurations, it's all the bags you need, all in one. At carry-on size, it saves you the bag fee on your outbound flight, and the sling strap makes the airport schlep easy. Shrink it down, switch to the padded backpack straps, and take it camping. At the end of your trip, after you buy gifts at those cool artisanal markets, shazam! It's a big duffel. 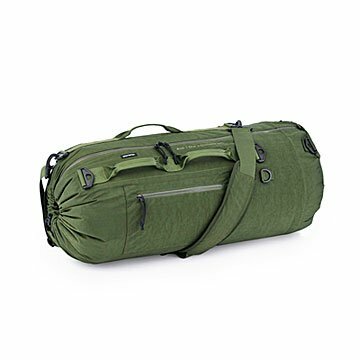 The lightweight, sturdy materials and construction can easily handle the load, and various zipper pockets hold what needs to be easily accessible. Give your gym bag, backpack, weekend bag, and duffel one-way tickets to Donation-Ville, collapse the bag into a small ball, and gaze joyfully at the newly empty space in the closet. Made in China. Hand wash with mild soap, cold water, and hang dry. Check out a tutorial on The Adjustable Bag here.